As Chinese ports, shipping lines and authorities strive to reduce emissions from shipping, Cavotec's shore power technologies are helping achieve this goal. 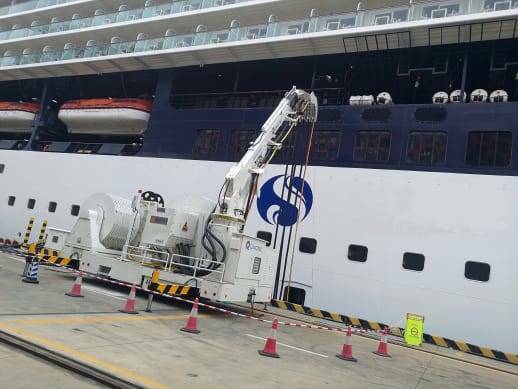 Cavotec engineers recently commissioned a self-propelled, battery-powered shore power solution, Cavortec AMPMobile, at the Taiiwan cruise terminal at the Chinese Port of Shenzhen. The unit’s batteries are charged while it connects vessels to the grid. Two other cruise terminals, Wusong in Shanghai and Qingdao in Shangdong, will soon be equipped with similar systems, setting the standard for shore power interfaces for cruise terminals in China. Cavotec established shore power in the 1980s, while AMPMobile first debuted at the Port of Los Angeles in 2011, followed by six more units in Californian, Chinese, and European ports. AMPMobile is also used to power cruise vessels in Canada. Cavotec also develops solutions that connect and charge electric and hybrid vessels.